I am attempting to write more about what I make every single week. I hope I can keep the consistency over the year. 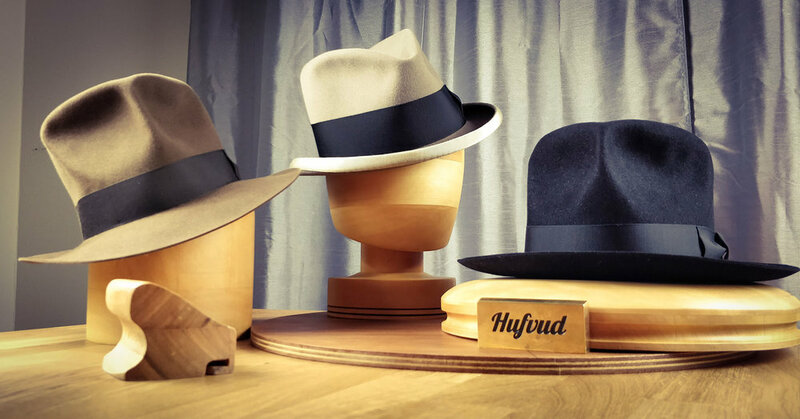 For you that ordered a hat, or thinking of ordering a custom fedora, this is a way to see what else has been created and find inspiration for your desired hat. I currently create or work on 3 - 4 hats per week. More than that I simply can’t handle at the moment all by myself. Let me show you what I made this past week. Starting from the right is the Sable Brown LEIFUR Lucky FEDORA. Worth to mention from the start, all the hats this week are Rabbit & Hare Deluxe blend fur felt. LEIFUR Lucky has been a very popular hat, not just in brown but in various colors. The black hat in the photo above is a LEIFUR FEDORA as well. The hat is such an iconic piece that just wearing it in your favorit color makes it worth having. I wear my 30X Beaver Dark Brown Rust LEIFUR every day when I move around outside of the studio. I personally love the style and I made mine to fit with my desired brim width. I also have a shorter brimmed Sand color LEIFUR for the summer months. The style never gets boring. The middle hat is a fully custom IVAR HOMBURG with a requested lower front and taller rear. The length of the brim after curl has been requested as well. To have this mixture of colors from felt to hatband and brim band makes this one of my most unique hats to date. Homburgs have been ordered more than usual lately. They take longer to make which also delays other orders. First come first serve is what I follow for all orders and I would not accept to make an order faster than the current order line. The brim binding on these hats take a full day to complete. Before that the brim needs to be prepared well enough to be ready for the binding. As I mentioned at the beginning I work on 3 - 4 hats per week. There is another Moss Green RAGNAR Fedora with bound edge that did not get any farther than the a complete sweatband assembly. Expecting to finish up this hat at the beginning of next week and still work on the next 3 hats in line. The Moss Green has been a very popular choice for many looking for both a Autumn and Winter hat. The lighter sage green that I have as well starts to become more popular in Spring. A normal day in the studio starts with working the felt and assembly of various parts into the felt. Sweatbands and liners are all stitched during the evenings. Its currently the only way that I can finish up these hats on time. I would probably spend 8h a day in the studio then bring home a few stitching assignments in the evening until late while answering emails and planning the next day. Perhaps this can explain the 8 week waiting time for a custom made hat. Hope you are having a great relaxing weekend too.